Over the past few weeks, Barun S. Mitra of the Liberty Institute has been endorsing China’s proposal to lift its ban on trade in tiger parts. It is, he argues, the only way to save wild tigers—tiger farms in China have no less than 5,000 tigers in captivity; as tigers “breed easily in captivity, these can quickly ramp that number up to 100,000 in 10-15 years"; as the market fills with farmed tigers, poaching will become economically unattractive. His glib assertion leaves all sorts of questions unexplored. Can tiger farms really make poaching unviable? A tiger takes three years to grow into adulthood, and consumes close to 5kg of meat every day till then. Add to that taxes, the fixed costs of land and buildings, and variable costs of manpower and electricity. 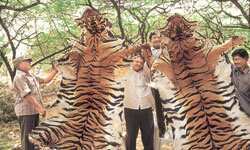 But, it costs Rs200 to poach—all that’s needed is a foothold trap or pesticide to sprinkle for a tiger kill. Astonishingly, Mitra brings up none of these issues while clamouring for tiger trade. Another issue he doesn’t raise is the trend in China’s wild tiger population. By the early 1980s, Mao’s war on what he termed pests during The Great Leap Forward was over. About 150-200 wild tigers somehow survived. Between then and 1996, since tiger farms were trading till 1993, one would have expected a spike in wild tiger numbers. But, by 1996, China’s wild tiger population was down to 30-80. We are not emphasizing this point more as we couldn’t find the numbers for 1993. That leaves us with the original question. How do we save the wilderness that the tiger is meant to epitomize? We cannot rely on the state. Its apathy towards saving the environment is matched only by its ineptitude. An article I read some weeks ago advocated national park privatization. While the answer does lie in linking conservation and people’s self-interest, there is something horribly ham-handed about our attempts to link the two. We characterize the relationship between poor people living around the forests and the animals in them as adversarial. Which is odd. The well-being of both depends upon the forests staying intact. It is a far stronger incentive than anything that tiger farms, national park privatization, or the most prevalent form of private enterprise in Indian conservation today—hotels and sightseeing outfits—can deliver. All these do is employ some locals as drivers and guides but leave the larger community around the park as impoverished, as embittered towards the forest as ever. Yet, that incentive never quite surfaces in debates such as this. All we get are half-baked suggestions held together by little more than the intellectual equivalent of chicken wire and chewing gum. If farm we must, it has to be a model that benefits those who affect, and are affected by, the tiger the most. Else, poaching will persist. The parallel with crocodile farming is instructive here. Unlike what Mitra suggests, crocodile farming has not been successful in arresting the decline of crocodile population. It worked wherever the model ensured the locals got a greater benefit from farming crocodiles than from poaching them or destroying their habitat. Nor is farming the only way to create these linkages. In Periyar, the park management has been hiring poachers as park guides. The Great Himalayan National Park has used microcredit to create livelihoods—medicinal plant cultivation, tourism services, sale of local products like almond oil—for the poorest people around the park. In Orissa, the Orissa Marine Resources Conservation Consortium of fishworkers’ unions, conservation bodies and development NGOs is using a novel tack to save Olive Ridley turtles. Instead of halting all fishing in the protected area, which hurts the local community even as the trawlers—aware that the state lacks resources to monitor—flout the restriction, it is using small fishermen to monitor illegal fishing by trawlers. The former are happy to—the trawlers threaten their livelihood. When they force the trawlers to stay away, fewer turtles drown in trawlers’ nets. All we need is a tad less top-down thinking—be it by the state, or by the exponents of markets.